An instructor leads the children through the day's plan at the Harmony school. The staff here may not be paid much but are deeply committed to supporting this underserved population. Students await their afternoon activities. 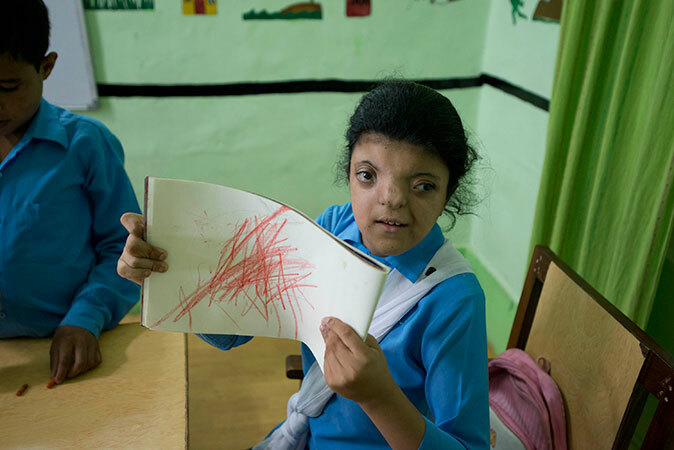 The children of the Harmony school receive education and occupational therapy. Drawing time at the Harmony School. The program works to develop key skills for the students, such as motor skills through drawing. Directed yoga helps the students to stretch and take better control of their bodies. In addition to this work with the students, the Harmony program also works with the families in order to develop the best strategies for supporting the children. Harmony Through Education (HTE) was started by a young psychology student. After he spent time volunteering in northern India in 2006, he quickly realized the lack of services. This young psychology student identified people living with mental and physical disabilities. As well as the social stigma these families faced. HTE was formed to provide education and life skills to children with special needs, as well as provide outreach support for their families and bring awareness of disability issues to the community. TFI has supported this school since its inception, and the school hopes to become self-sufficient with support from families and local government that will give more children opportunities in their own community. To donate specifically to Harmony through Children, write “Harmony” in the comments section.